Ekornes of Norway has been known for producing the world's most comfortable seating for over 40 years. Their Stressless recliners provide unsurpassed ergonomics and beautiful styling, and with a wide variety of models, leathers, fabrics and wood finishes to choose from, you can truly make these chairs your own. 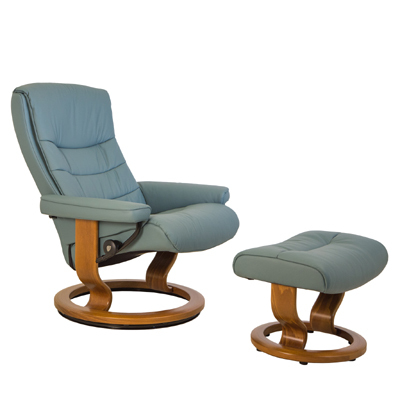 Nordic medium chair and ottman teak with aqua green leather. Size: L 29 1/2"W 29 1/2"H 39 1/2"